In 2017, when Descend was going on, we were deep in fomo becasue of the van build. This year, we had nothing going on and we were only 6 hours away! So we booked our tickets and sent some feelers out into the Social Media world as to whom was headed to this event. The meet up started a couple years back with just a couple of VW owners meeting up and camping out together. @posidensbeard, of Instagram, was one of the original founders of the group years ago and he was the guy that pulled us out of the dirt when we got stuck, upon arrival. Absolute Legend. Also when we got stuck, it was amazing to see how many people were ready and excited to come help you get unstuck. We were really embarrassed when it happened, but we ended up camping with some of the people that helped us. It was an awesome couple of days with new and old friends. In short, it was really an awesome event of like minded people coming together and enjoying being neighbors for a couple days. 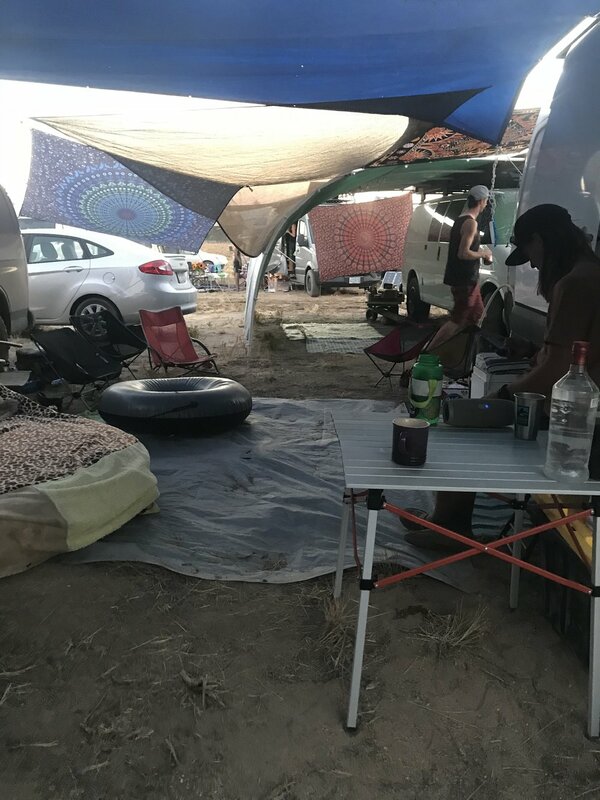 We had a little tarp shade area, called Vankookz Village, where all our kooky van friends got together, created a communal shady space with good tunes, good vibes, and free drinks, if you happened to bring your own cup. Dani was giving light up hula hoop lessons at night and Ross, @savanavan on Instagram, brought his game Shut the Box. It also lit up, so when it was dark, we had quite a crowd playing the game or learning to hula hoop. Sam, aka @samvanzam, brought her Bloody Mary’s and they were a hit! Besides creating our own little inviting communal vibe at our camp, we participated in events like tree planting, or if you fancy morning Yoga, there is a Hike to the Hole with Yoga there! Other Descend events include an epic swap, sell, or barter meet up, gear repair, an amazing BBQ, Pancake breakfast, $2 gear raffle, amazing live music, Potluck dinner, Chili Cook-Off, and Salsa Contest, which the winner for the salsa has been holding down that gold for two years running now! So bring your best Salsa game or your best shared dish, just like your mom or grandma always made it. On Saturday, they have their iconic Syncro Run to the Hole, where all the Syncro’s head into the hole for some good ‘ol fashioned VW fun. We met so many awesome people at Descend on Bend that we didn’t want it to end. So, we planned on meeting up at Skull Hollow Campground, a little north of Smith Rock State Park. We circled up, kept the potluck vibes going as we all collaborated on meals to share with our group. We helped each other on passion projects. As one person would leave the group, another would chime in on Instagram and would show up. It was like our Vankookz Village 2.0 was breathing and growing. We plan on Descending next year and decompressing with some kookz in 2019 at Skull Hollow. So plan on doing both, if you are into it. CHECK OUT OUR VLOG FROM DESCEND!